Non-slip plastic sheeting for carpets covered by towels and secured with duct tape, if planning a waterbirth. Snacks (for hard working moms, partners and midwives!) Some examples are chips, fruit, veggies, cookies, cheese and crackers, protein bars, bagels, toast with peanut butter/jam, etc. Sieve, extra towels, foot stool, clean bath mat and/or kneeling pad, pool thermometer if planning a waterbirth. Please read the guidelines below for filling your birth pool appropriately. Barrier cream such as Coconut oil or Vaseline for baby’s bum (the first poop’s are sticky!) Olive oil is no longer recommended. All items should be gathered together and kept in one laundry basket four weeks prior to your due date. All towels, blankets, and mats should be clean and freshly laundered. Ensure your floors are swept, and clear of objects, with a space for your midwife’s equipment. We usually ask for a waist-high table or waist-high dresser to set up our equipment with two available electrical plug sockets next to this table to plug our equipment in once we arrive. We ask that you turn your exterior lights on after dark so that your midwives can find your home easily. If you do not have an outside light, a flashlight or lantern also helps to alert your midwife to the correct address. Make sure the exits of your home are clear of objects or large furniture. In the rare event transport to hospital is required, often paramedics will bring a stretcher into your home. Make sure your driveway is clear for the midwives to park quickly. There must be two parking spaces available for your midwives. If you live in a condo complex, your midwife may ask your birthing partner to meet them at the door to assist with carrying essential equipment. If you live in the countryside, and it is difficult to find your home in the dark, we request you place a lantern at the end of the driveway to enable midwives to attend your labour quickly. Also make sure your exterior lights are on to allow the midwives to see where they are going and make their path safe. During the winter months, we request that your driveway/entrance is shovelled and salted/sanded for the safety of our midwives. Pack a hospital bag in case of hospital transport and make sure you have your car seat and base installed. Please ensure you have made childcare arrangements for when you go into labour. If you plan to have your child/children remain at home, we request that you have an additional care provider to solely take care of their needs. Overnight, some children will sleep throughout your labour and birth, but we do request that you have someone present in case your child wakes up. We do ask that your child/children must not touch the midwife’s equipment. We ask that ALL pets are placed in a cage, a locked room, outdoors or have another place to go during your entire home birth experience. 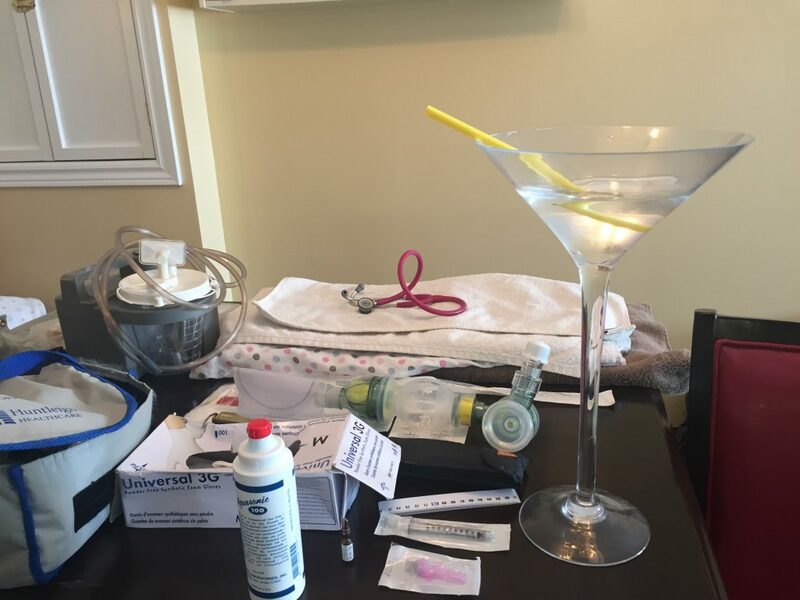 For health and safety (midwife allergies and fear of animals), our midwives, equipment, bags and sterile equipment must not come into contact with pets or pet dander. Please ensure your floors are swept, and dressers dusted to remove pet hair prior to labour. Some pets find the birthing experience stressful, and clients have often reported they cannot relax when their pets are vocalizing distress. You may find that it is beneficial for your pet to go to a neighbour’s, friend’s or relative’s home when you go into labour, so that minimal interruptions are maintained. Should you require transport to hospital, you know your pet already has a care provider, too. 1. Put on a good fitted sheet and put on a good top sheet. 2. Put plastic sheeting over the good sheets and secure ensuring there are no gaps to allow leaking through to sheets. Safety pins or duct tape can be used to secure the sheets if necessary. 3. On top of the plastic sheets put a clean, older, fitted sheet for the birth followed by an older top sheet and any other blankets you wish to use for the birth. 4. Prepare 4-6 pillows in the same manner with clean pillowcases, with a garbage bag to protect the pillow and a clean, older pillowcase on top. Sanitary pads, lightly dampened and frozen in a ziplock bag (for cold compresses after the birth) You may use aloe vera and/or arnica on the pads if you wish to assist with healing. Click here to find out how to make padsicles! 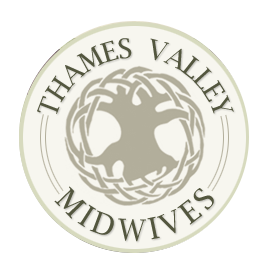 Your midwives will discuss your plans of water birth during your prenatal appointments. Your pool should not be filled before active labour and the water should be changed after 6 hours. You should only enter the pool under your midwife’s instructions. To fill and empty your pool, you will follow the instructions below to ensure adequate preparation prior to labour. Your pool should be located somewhere that your midwife can easily reach you from at least two sides of your pool. You should also set up a mattress (prepared as instructed above) near the pool in case your midwife needs you to leave the pool due to an emergency. It is the client’s responsibility to set up and maintain the pool. During labour, the water must completely cover your abdomen, but not reach the level of your neck. Most pools have an indicator line to let you know when the pool is full. The water should be comfortable and below 99.5 degrees Fahrenheit or 37.5 degrees Celsius. The temperature is important to prevent you and your baby from getting too hot. You should ensure you have plenty of fluids available at home like electrolyte drinks such as hydrolyte or gatorade, popsicles, or ice chips. No additives such as soaps or essential oils should be added to the water. There have been recent cases presented in the media of Legionnaire’s infection in newborns that have been associated with water birth. Legionnaire’s disease is caused by L. pneumophila bacillus, which exists where water collects and can become airborne. Sources include puddles, stagnant pools, lakes, rivers, ponds, and streams. In hospitals, where the majority of infections and outbreaks occur, the bacillus can exist in the plumbing and air conditioning. In the cases of community acquired Legionnaire’s, the bacillus can come from sources such as whirlpool bathtubs, hot tubs and public spas, plumbing systems in homes, air conditioning systems, humidifiers that generate a mist, fountains and water features. The risk of Legionnaire’s infection cannot be eliminated completely, however it can be reduced by cleaning and disinfecting bathtubs and birthing pools intended for use for the labour and birth of your baby. 1) Confirm the quality of water it not potable municipal water (e.g. recent testing of well water in the past year). Municipal and well water is generally considered safe if not left in the pool for more than 6 hours. Do not use recycled water to fill your pool. For example, do not fill the tub will wastewater streams generated from households or office buildings including sinks, showers, baths, clothes washing machines or dishwashers. 2) If using your bathtub, clean your bathtub by using a cleaning solution to remove all visible dirt, stains, and oils. Remove all toys, bath mats and other items. 3) Clean and disinfect the pool or tub before installing the liner and after use. 5) Rinse your pool or tub well with hot water, using a new potable water hose (not a garden hose). Hot water should be run from the tap for at least 3 minutes before connecting the hose and rinsing the tub out. 6) Before filling the tub or birthing pool for labour, run the hot tap water through the hose or tap again for 3 minutes to clear the hose and pipes of stagnant water and sediment. A new unused potable water hose should be used each time the pool is filled. Hot water should be run from the tap for at least 3 minutes before connecting the hose and adding water to the pool. 7) If you are using a pool, insert a new liner. There are increased risks of infection when there are jets, bubbles, heating systems. If your tub has a heating or recirculating system please consider using a disposable liner in your bathtub. Run your hot water for 3 minutes before filling the tub and refill every 6 hours. If there is visible contamination prior to refilling, your tub should be cleaned and disinfected again. If you are renting a tub please make sure you have read the guidelines on how to prepare the tub for birth. Please make sure you are renting or buying from a supplier that is intending the product to be used for labour and birth. Water should be fresh and the tub filled only when active labour is established. Dispose of all debris – blood clots and feces. Use a submersible or external pump. Empty contaminated water (water containing feces, urine, toilet water) into toilet. Dispose of liner, debris net, etc. Clean and disinfect all items used in the birth pool, especially if they have come in contact with feces, urine, or toilet paper. Store your pool for next time according to manufacturer’s instructions and where the pool will remain dry and free of soil or other environmental debris.